I PUT THESE HANKIES INTO ONE LOT BECAUSE EACH HANKY HAS A LILY OF THE VALLEY THEME – EITHER AS THE FOCUS FLOWERS OR AS ACCENT FLOWERS! 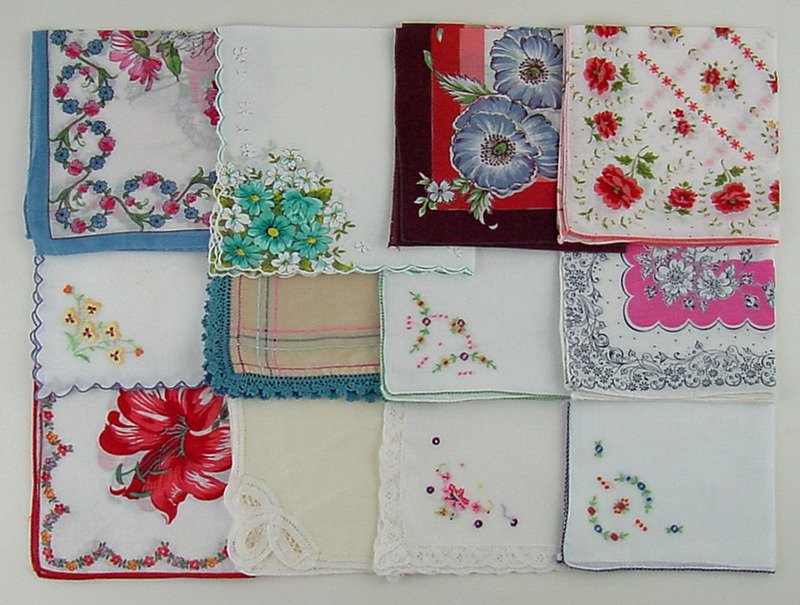 ALL ARE PRINTED FLORAL WITH THE EXCEPTION OF THE FIRST ONE TOP ROW LEFT AND THE LAST ONE IN SECOND ROW – THEY’RE EMBROIDERED -- AND THE PINK AND BLUE IDENTICAL ONES IN BOTTOM ROW – THEY’RE NYLON AND IT IS UNUSUAL TO FIND NYLON HANKIES WITH LILY OF THE VALLEY ON THEM! 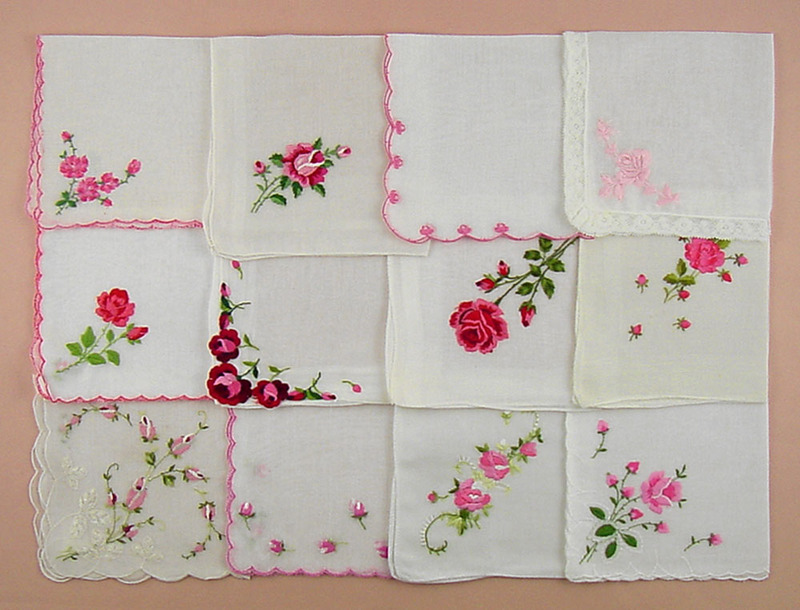 THIS LOT OF ONE DOZEN VINTAGE HANKIES HAS PINK EMBROIDERED ROSES! THIS VINTAGE HANKY LOT IS A LITTLE DIFFERENT! THERE IS A TOTAL OF 12 HANKIES BUT THERE ARE 6 MATCHING PAIRS – 2 OF EACH PATTERN/DESIGN – THERE ARE EVEN 2 PLAID HANKIES IN THE LOT. 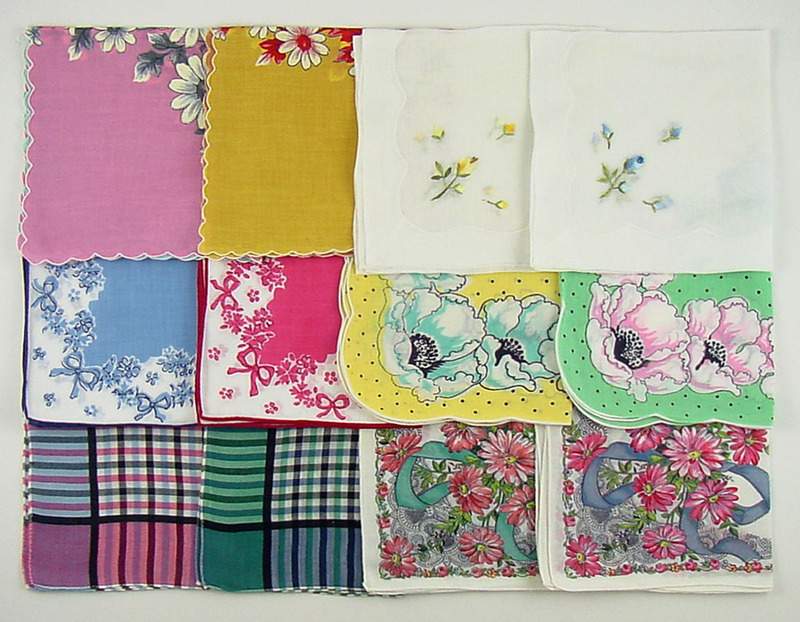 I AM LISTING SUCH A LARGE VOLUME OF HANKIES THAT I AM ONLY POSTING 1 PHOTO SHOWING ALL 12 HANKIES FOR EACH LOT. 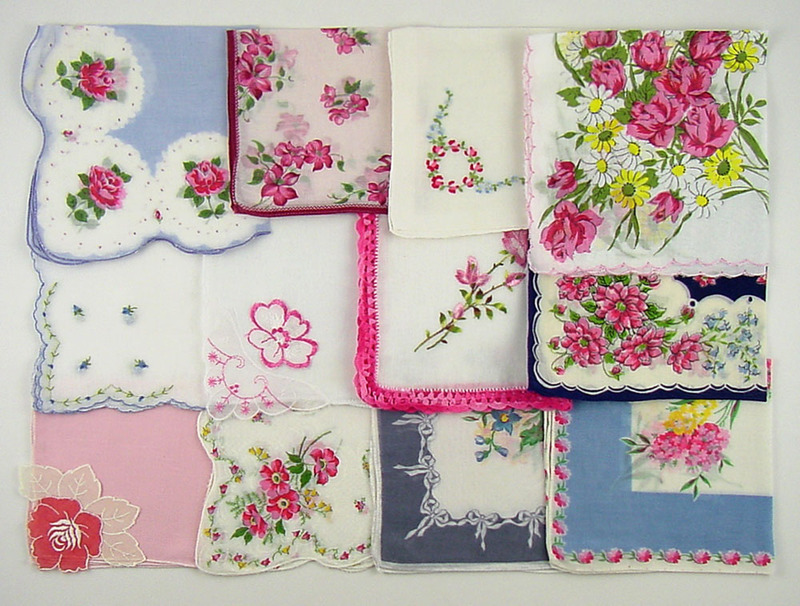 THIS LOT HAS AN ASSORTMENT OF PINKS – PINK EDGING AND PINK FLORAL HANDKERCHIEFS. I HAVE COLLECTED VINTAGE HANKIES FOR MANY, MANY YEARS -- STILL DO!! -- AND WILL BE LISTING MANY HANKY LOTS. THIS LOT HAS HANKIES WITH PINK AND/OR BLUE THEMES BUT MOSTLY PINK. THIS LOT HAS AN ASSORTMENT OF PINKS – PINK EDGING AND PINK FLORAL HANDKERCHIEFS. 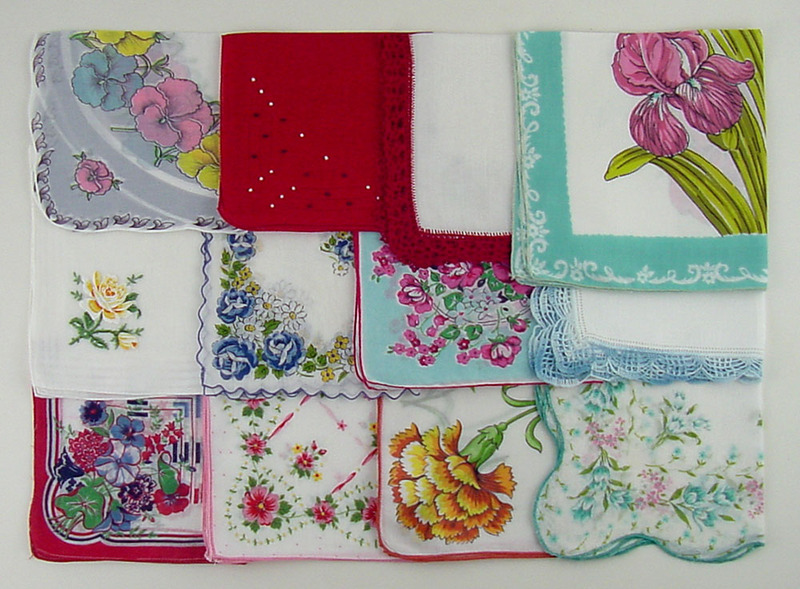 I AM LISTING SUCH A LARGE VOLUME OF HANKIES THAT I AM ONLY POSTING 1 PHOTO SHOWING ALL 12 HANKIES FOR EACH LOT. I USUALLY PURCHASE HANKIES IN GROUPS AND OFTEN THERE ARE SOME NEWER HANKIES IN THE GROUPS. I HAVE BEEN SETTING THOSE ASIDE AS I IRON THEM UNTIL I HAVE ENOUGH TO LIST AS A GROUP. THE MATERIAL IN THESE NEWER HANKIES IS A THICKER/HEAVIER COTTON THAN OLDER VINTAGE HANKIES WHICH MAKES THEM PERFECT FOR CRAFTING! ALSO THE FLORAL ONES ARE PERFECT WEDDING SHOWER GIFTS, MAKE EXCELLENT LUNCHEON NAPKINS, AND WOULD BE PERFECT PLACED IN A BASKET FOR HAPPY WEDDING GUESTS TO USE AND TO HAVE AS A REMEMBRANCE OF YOUR WEDDING! I AM LISTING SUCH A LARGE VOLUME OF HANKIES THAT I AM ONLY POSTING 1 PHOTO SHOWING ALL 12 HANKIES IN THE LOT. THESE HANDKERCHIEFS HAVE BEEN LAUNDERED, LIGHTLY STARCHED AND IRONED BY ME. ALL MY HANKIES ARE IN EXCELLENT CONDITION AND ARE FROM A SMOKE FREE ENVIRONMENT. I HAVE COLLECTED VINTAGE HANKIES FOR MANY, MANY YEARS (STILL DO!) AND WILL BE LISTING MANY OF THOSE HANKIES IN LOTS. WITH THE EXCEPTION OF THE CHILDREN'S HANKY (WITH THE HORSES ON IT), THE MATERIAL IN THESE NEWER HANKIES IS A THICKER/HEAVIER COTTON THAN OLDER VINTAGE HANKIES WHICH MAKES THEM PERFECT FOR CRAFTING! ALSO THE FLORAL ONES ARE PERFECT WEDDING SHOWER GIFTS, MAKE EXCELLENT LUNCHEON NAPKINS, AND WOULD BE PERFECT PLACED IN A BASKET FOR HAPPY WEDDING GUESTS TO USE AND TO HAVE AS A REMEMBRANCE OF YOUR WEDDING! ALL HANKIES HAVE BEEN LAUNDERED, LIGHTLY STARCHED AND IRONED BY ME. 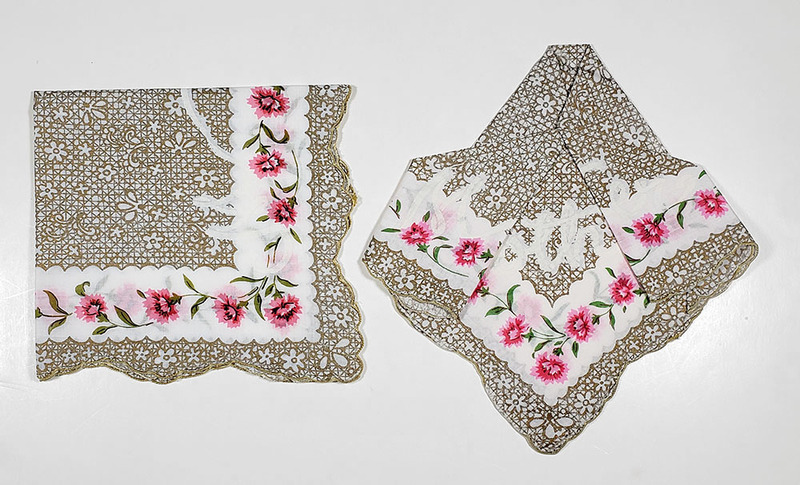 THIS GROUPING OF VINTAGE HANKIES FOR MOTHER ALL SPELL MOTHER WHEN FOLDED CORRECTLY – I HAVE FOLDED AND PRESSED SOME OF THEM SO YOU CAN VIEW THEM A LITTLE BETTER. THE AVERAGE SIZE OF THIS GROUP IS 13” X 13”. HANKIES HAVE BEEN LAUNDERED, LIGHTLY STARCHED AND IRONED (BY ME). THEY ARE FROM A SMOKE FREE ENVIRONMENT. PLEASE SPECIFY WHICH ONE YOU WISH TO PURCHASE WHEN ORDERING – LIKE TOP ROW RIGHT, BOTTOM ROW CENTER, ETC – SO I WILL BE CERTAIN TO SEND THE CORRECT HANKY! ALSO, THE ONE WITH THE LARGE PINK CARNATION (BOTTOM ROW LEFT CORNER) WAS SUPPOSED TO BE IN LOT #H13 (THE $12 EACH GROUP) BUT SOMEHOW IT GOT IN THIS GROUP WHEN WE PHOTOGRAPHED! IF YOU WISH TO PURCHASE THIS ONE, YOU WILL BE CHARGED $12 (JUST REMIND ME!). TWO SOLD (BOTTOM ROW MIDDLE, TOP ROW CENTER). 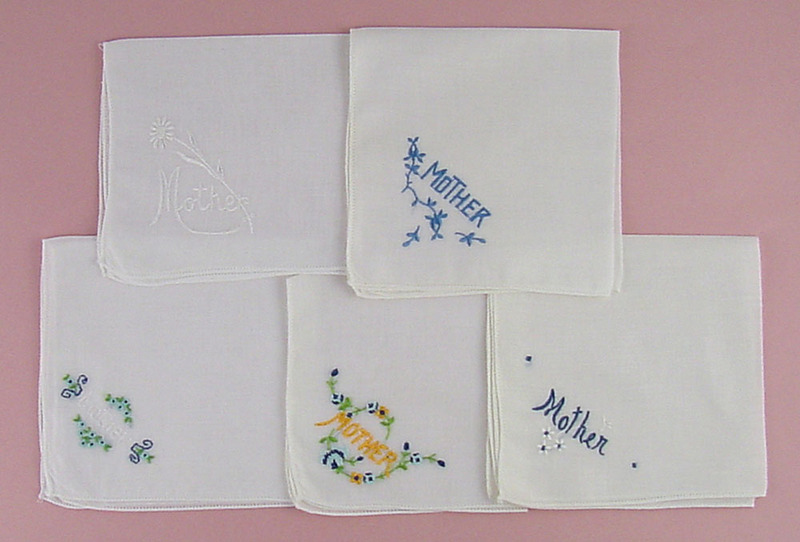 THIS GROUPING OF VINTAGE HANKIES FOR MOTHER HAS SIMPLE, EMBROIDERY DESIGNS THAT ARE VERY PRETTY BECAUSE OF THEIR SIMPLICITY! 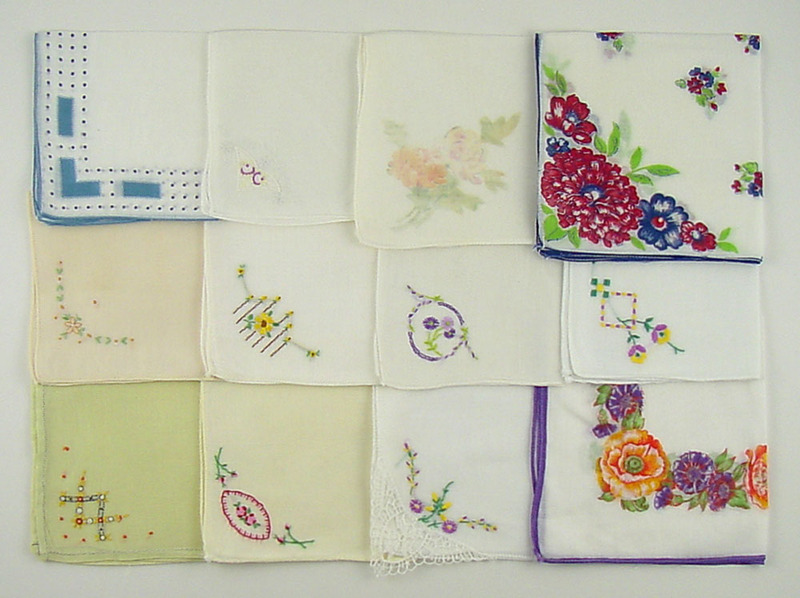 EACH HANDKERCHIEF MEASURES APPROXIMATELY 11” X 11” AND IS IN EXCELLENT CONDITION. 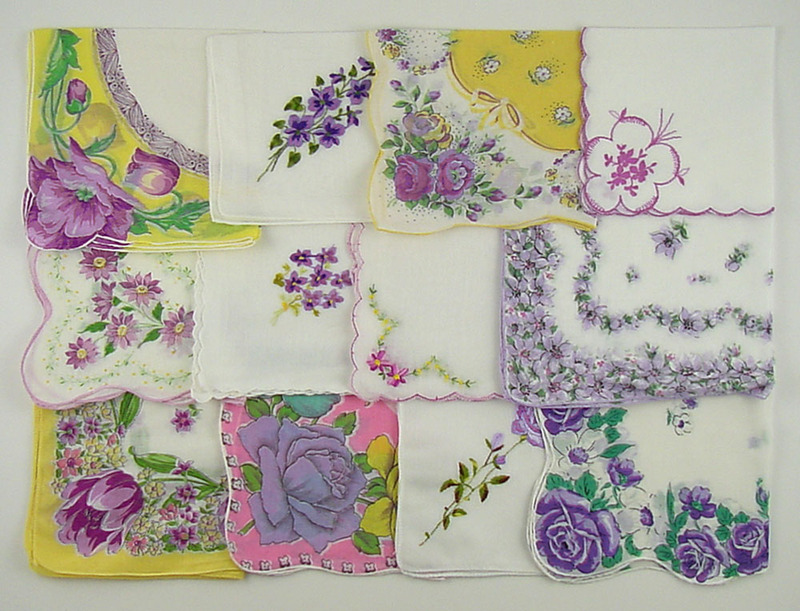 THIS VINTAGE HANDKERCHIEF LISTING HAS YOUR CHOICE OF BEAUTIFUL HANKIES FOR MOTHER! THEY RANGE IN SIZE FROM 10” X 10” TO 12” X 12”. EACH IS BEAUTIFUL WITH ELEGANT DESIGNS AND GORGEOUS EMBROIDERY. ALL ARE IN EXCELLENT CONDITION. 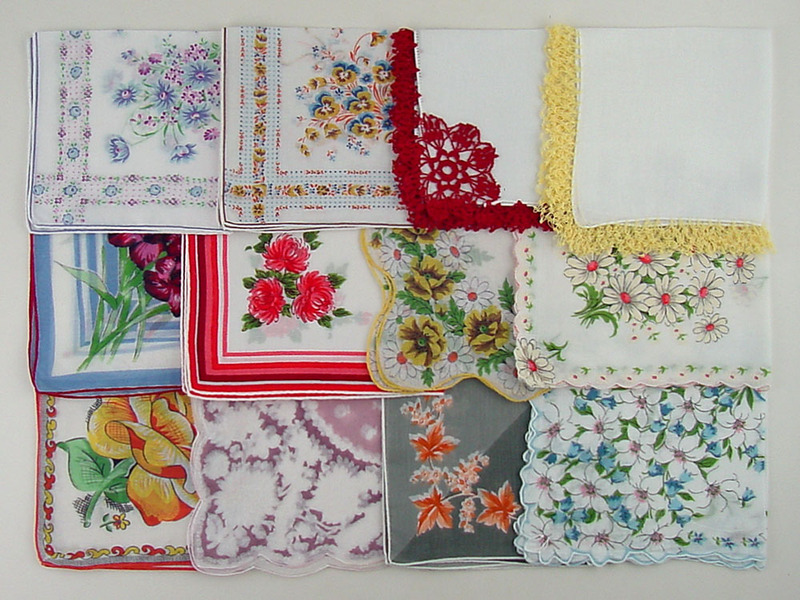 PLEASE SPECIFY WHICH ONE YOU WISH TO PURCHASE WHEN ORDERING – LIKE TOP ROW RIGHT, BOTTOM ROW SECOND FROM LEFT WITH RED FLOWER, ETC – SO I WILL BE CERTAIN TO SEND THE CORRECT HANKY! TWO SOLD (TOP ROW LEFT & CENTER). 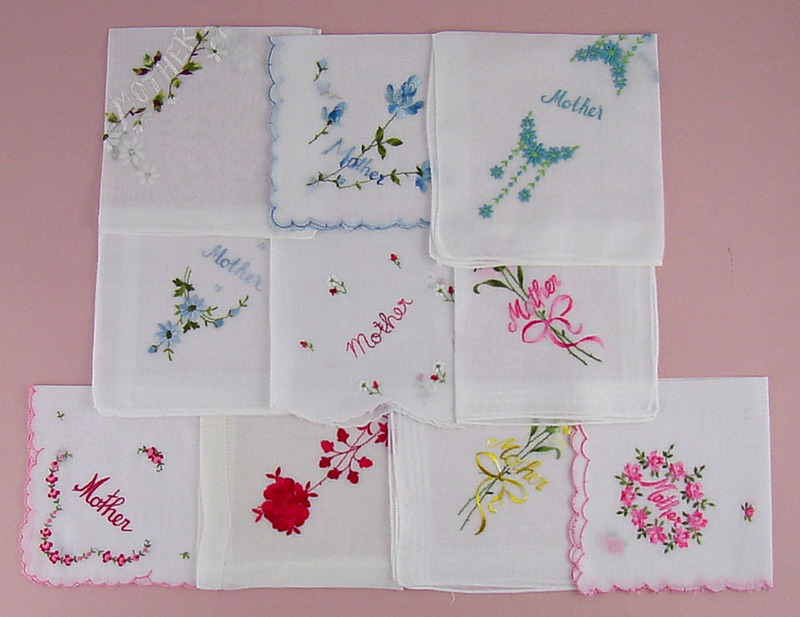 ANOTHER PRETTY GROUPING OF HANKIES FOR MOTHER! WHEN FOLDED CORRECTLY, THE LETTERS FROM THE WORD MOTHER. HANKIES MEASURE 12” X 12” AND IN EXCELLENT CONDITION. HANKIES HAVE BEEN LAUNDERED, LIGHTLY STARCHED, AND IRONED (BY ME). THEY ARE FROM A SMOKE FREE ENVIRONMENT. I’VE GROUPED THESE TWO HANKIES TOGETHER BECAUSE THEY HAVE THE SAME DESIGN/PATTERN ONLY IN DIFFERENT COLORS! HANKIES MEASURE 12” X 12” AND ARE IN EXCELLENT CONDITION. WHEN FOLDED CORRECTLY, THE LETTERS LINE UP TO SPELL MOTHER. 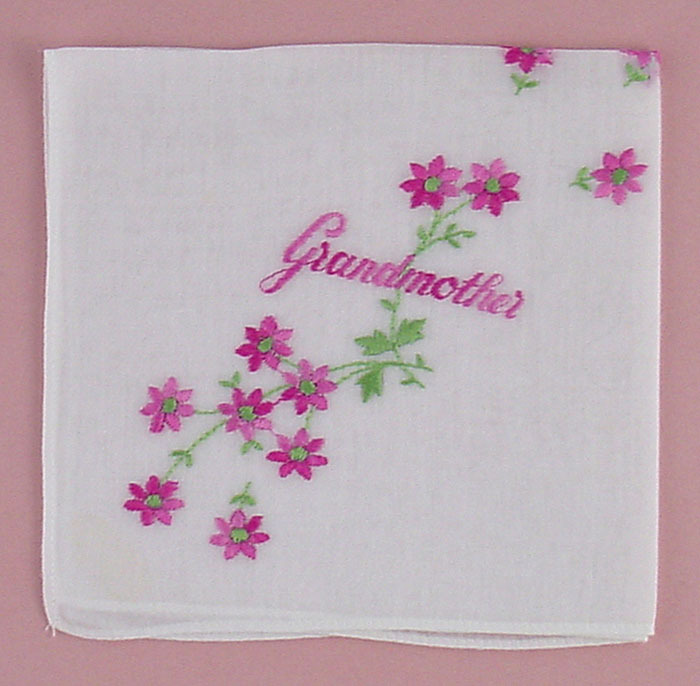 ANOTHER BEAUTIFUL HANDKERCHIEF – THIS ONE IS EMBROIDERED FOR GRANDMOTHER! HANKY MEASURES 11” X 11” AND IS IN EXCELLENT CONDITION. HANKY HAS BEEN LAUNDERED, LIGHTLY STARCHED, AND IRONED (BY ME). IT IS FROM A SMOKE FREE ENVIRONMENT.